Free Mumia Abu Jamal and all political prisoners! It is at the AGM that we elect members into all positions on the Executive Committee; faculty stewards; international steward; Unit 1 instructor steward; health and safety officers; one trustee with term ending April 30th 2022; and labour council delegates. See full list of positions open for elections below. The amendment to bylaws that will be discusses and voted on concerns the addition of a new position to the Executive Committee – Health and Safety Officer. If this motion to create this H&S officer passes, the position will be a part of the general election at this AGM. This means that it will be open for nominations and members can run for it. Any member in good standing can run for a position. A member in good standing is a member who has filled and signed CUPE Application for Membership card. We will have these cards available at the meeting for you to sign if you haven’t done so already. Our February general meeting is after the reading week, on TUESDAY, FEBRUARY 26 at 3 pm in Welsh Hall room 207. Voting on Proposed Bylaw Changes* these proposed amendments are going to be discussed and voted on at this meeting. Report from delegates to the Ontario University Workers COordinating Committee – a sectorl committee [OUWCC] of CUPE Ontario. The conference is Feb 21 -24 and the members have elected 5 delegates. Three books are going to be given away to lucky members in a draw: 1., 2, and 3. The GMM starts at 4 pm in Plaza 600F – a room with a nice view. 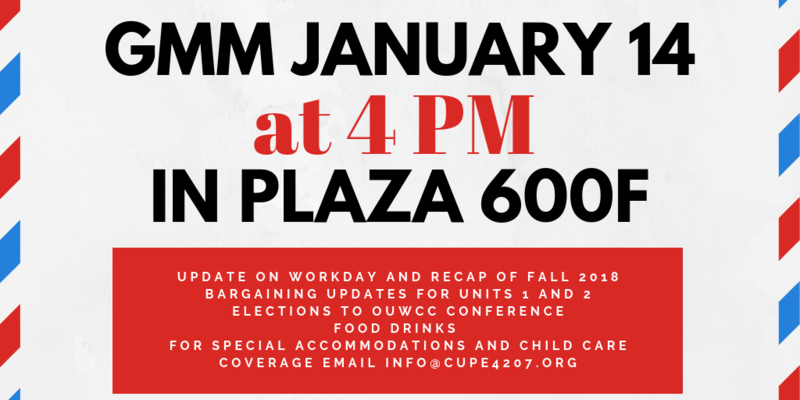 The OUWCC stands for Ontario University Workers Coordinating Committee, a sectoral committee of CUPE Ontario. CUPE-organized workers at any Ontario university campus choose their campus representative for two years duration to serve on the OUWCC board and act as a liaison between the committee and the CUPE workers organized on campus. Each university CUPE local can choose to affiliate with the OUWCC and send delegates to the conference of the university sector – the OUWCC conference. The aim of the conference is to benefit form shared strength and experience under and one common employer — the university industry. The conference is held at the CUPE Ontario headquarters in Markham. Registration and accommodation is covered by our local. This GMM is significant as we are goi ng to elect five members to Unit 1 Bargaining Committee. This election is conducted nine months prior to our collective agreement expiry date (September 7, 2019). Preparations for bargaining is a lengthy and labourious process that requires serious engagement of all members elected. After all, the language in our collective agreement (the contract negotiated between the union and the university for the next period) has serious bearing on the working conditions of the 1,000 members in Unit 1, and by extension also on members of Units 2 and 3. We know well that our working conditions both directly and indirectly affect students. 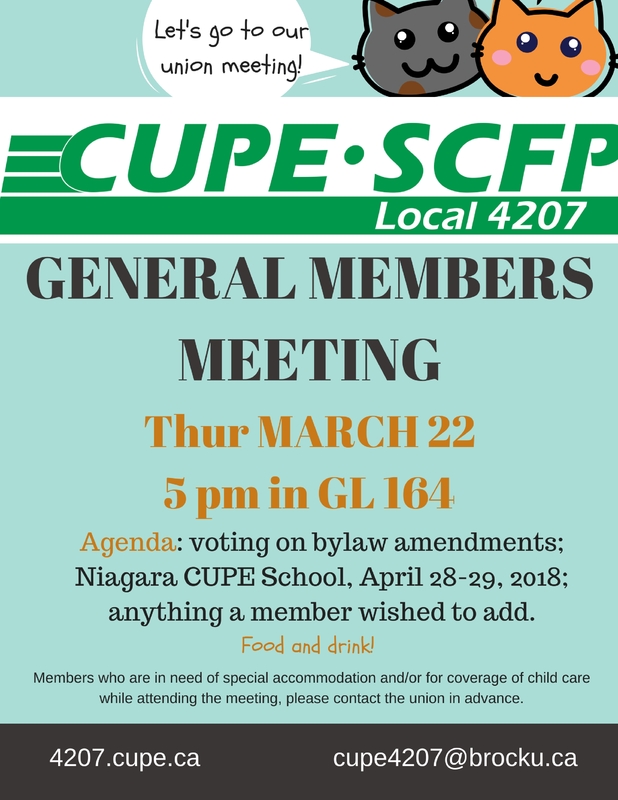 We are holding two special membership meetings with the objective to present, discuss and vote on our local bylaws* that include the changes CUPE National asked our local to make for a full endorsement of the bylaws required by CUPE constitution. There are two steps to bylaw change. First, the local gives notice to members that change(s) to bylaws is being proposed. The second step of the process takes place at the next general meeting where a discussion about the bylaw amendment(s) takes place, followed by a motion to accept the amendment(s). To make change(s) to bylaws, two thirds of the votes are necessary to pass the changes. It is understood that members will acquaint themselves with the changes as presented in the first step, and come prepared to discuss and vote in the subsequent meeting. Here are the amendments to our bylaws as requested by CUPE National. Only the bylaw articles undergoing changes are being presented here. The bold text indicates addition of a new language; cross through text indicates replacement of the old text by the new/bold and/or proposed to be removed. The whole set of bylaws is on our website. there is also a proposed amendment to our Policies. In addition to our default agenda items, following reading of the Equality Statement, it is proposed to also read Recognition of Territory, and hold Moment of Silence for fallen workers. While we have been practicing these two acknowledgements, we need to have this practice recorded. 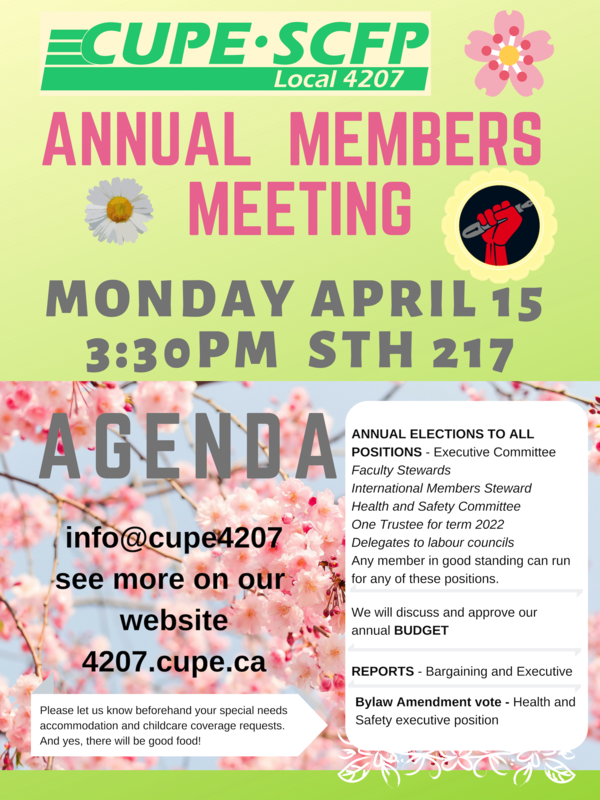 Our AGM is on Wednesday, April 11 at 4 pm in Thistle 325. The main item on the agenda at our annual general meetings is ELECTIONS. See the agenda for this AGM with all the positions that are going to be elected. The positions’ duties are listed in our bylaws. We will also be voting on two BYLAW AMENDMENTS. One large amendment, particular to Unit 1, speaks to strengthening of our bargaining practices by a) adding a Bargaining Research Committee on the roster of standing committees (standing committee means a committee that is mandated to exist and be active by our bylaws), and b) by ensuring greater transparency and collaboration between the Bargaining Committee (the one that meets and negotiates with the employer) and the other committees and membership in reporting on the developments in negotiations. The other amendment proposes to create another Vice President Position for Unit 1 that would be held by a graduate student member only. Our GMM is on March 22 at 5 pm in Glenridge room 164. On agenda is voting on proposed amendments to bylaws and policies. The proposed changes to our bylaws are available here. You can also find them in a post below. Hard copies are posted on CUPE boards in your department. The strike-through text means the language is targeted for removal, and the bold text is the newly added language. 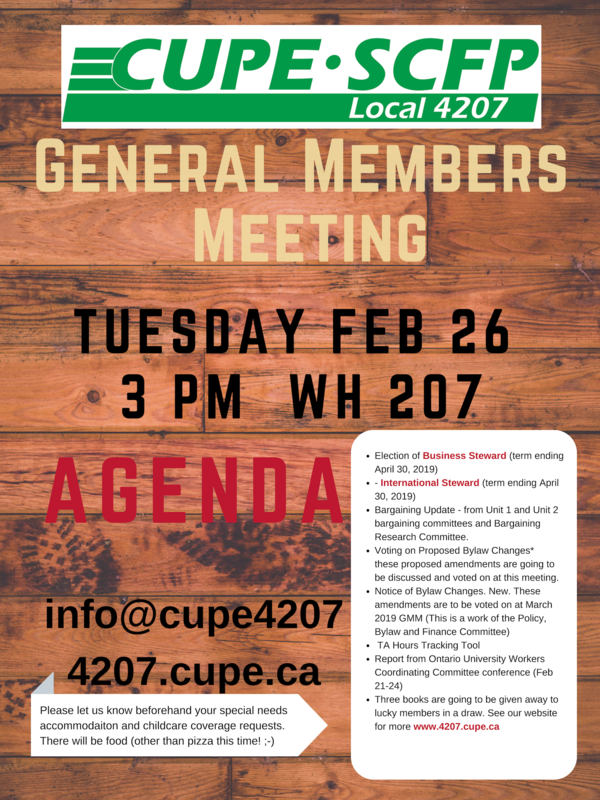 Our March General Members Meeting is on the 22nd at 5 pm, location to be announced. At the last GMM on February 28, a notice of change to bylaws was given. This means that attending members were presented with proposed changes to the bylaws of our local. On March 22, attending members will be voting on the acceptance of these newly proposed bylaw additions and changes. The Policy, Bylaw and Finance Committee is tasked with assessing the current bylaws and policies in order to be able to respond to the ever changing environment at our workplace. The addition of the Bargaining Research Committee and the changes to both Bargaining Support and Bargaining Committees reflect the pressing needs of our local to be better prepared for negotiations with the employer. The proposed changes are available here. The strike-through text shows the current language that is proposed to be removed, while the newly added language is in bold. 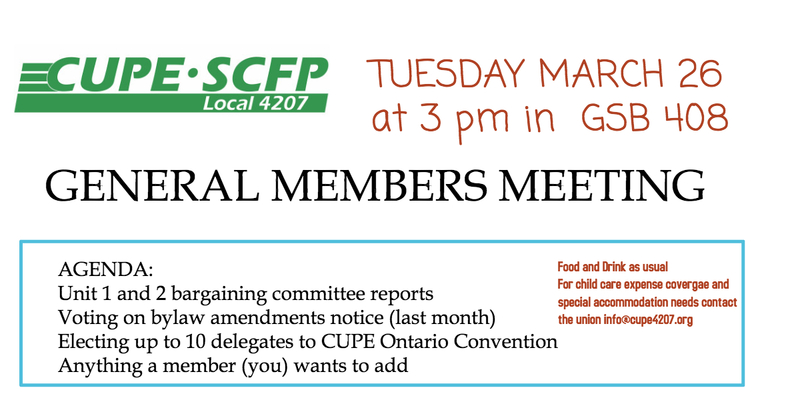 Our February General Members Meeting is on the last day of the month. We will be electing 10 delegates* to CUPE Ontario Convention that runs from May 30 to July 2, 2018 and is held in Toronto. Our local is affiliated with CUPE Ontario. This provincial body of CUPE holds annual conventions for delegates from CUPE locals all around Ontario. This year is an election year; this means that the delegates will be electing members of the executive board of CUPE Ontario, one trustee and eight caucus representatives. You can see the positions and other so far released logistics by clicking on the convention link above. The whole experience, engagement and learning is free to our members (transportation, accommodation and per diems). It is an opportunity to get involved in your union and see the incredible work the locals and the provincial division do to improve our working conditions, advance equality and social justice that benefits all workers. *The convention cannot run without the work of convention committees. Any delegate can apply to sit on any one of the five convention committees. Once elected as a delegate at this GMM, let the local know if you would like to put your name forward for one or any of the committees. Deadline for submitting the application for the convention committee service is March 1. One of the ways that CUPE members engage in shaping their union is by submitting resolutions to the convention’s Resolutions Committee that selects which resolutions are then submitted for discussion by the delegates and subjected to a vote. If adopted by delegates, the executive board and caucus representatives are bound by the resolutions and work on their implementation. A resolution to be sent to the CUPE Ontario for the convention will presented to members for consideration and recommendation. 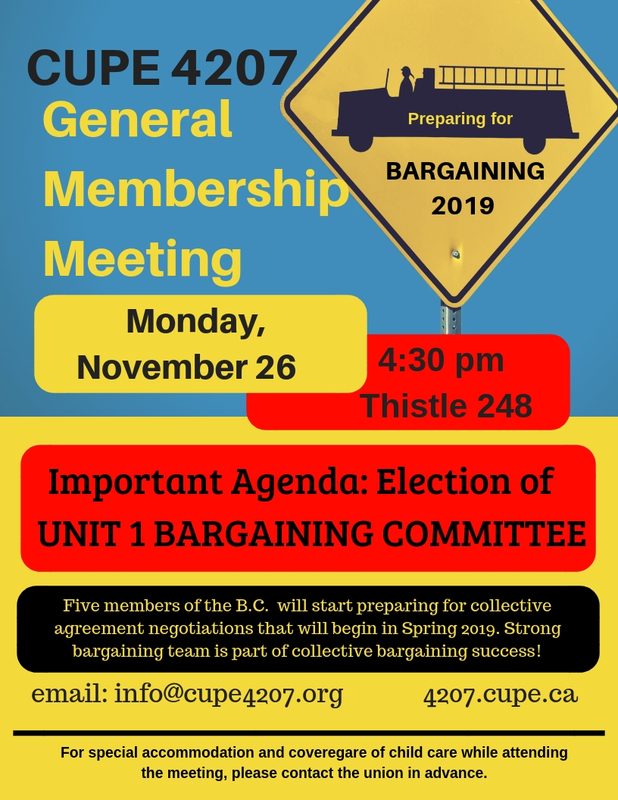 Notice to changes to our bylaws and policies will be given on the topics of Bargaining Support Committee, and introducing new Bargaining Research Committee as a standing committee. Subscription policy and Child Care policy changes notification will be given as well. All these bylaws and policy changes will be voted on at the subsequent GMM. Vote on a by law amendment( small and technical) change to bylaw 16.3** that was announced at GMM in November (adding conferences to capture the range of events to which our local normally elects delegates ). convention or conference without having to run for election. And any other agenda members deem fit to ad. And as usual, food and drinks to tie you over while you engage in the work of your union! Yes, attending general meetings is exactly it – engaging. Let your voice be heard!